An honour roll commemorates 59 people who served in World War One. 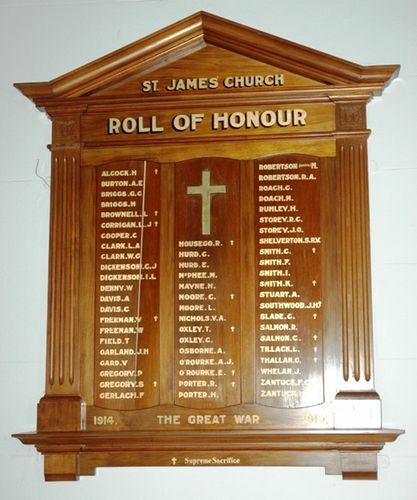 The unveiling of St. James's Church honour roll was performed by Bishop Hay, assisted by the Rev. V.C. Earle. There was a large attendance of people of all denominations. The Bishop delivered an eloquent address when removing the flag from the honor roll, and suitable hymns were nicely rendered by the choir. The service was very impressive. The Mercury (Hobart), 21st February 1922.